Thinking of Selling? What to consider beyond Cleaning & Staging. Clients who are considering selling in the not-too-distant future have asked if there is anything beyond cleaning, clearing out and possibly staging that they need to do before listing their home. Now that the market here in the Lower Mainland has changed from a hot sellers' market to a more balanced market, almost all offers to purchase will be subject to a building inspection. It's interesting how many buyers, once they've seen the building inspection and note deficiencies, will try to renogiate price or in some instances even walk away if there is anything that worries them. The key is to do the proper maintenance prior to selling on any items that could give them pause for concern. Often those items are smaller and easy to look after. 1) No GFCI protection: Electrical outlets near basins and sinks need a GFCI receptacle or breaker. An electrician can easily do that for you at low cost. 2) Downspouts too close to the foundation: Extend them about 4 feet from the house. Placing a concrete splash pad often does the trick. 3) Poor Roof Drainage: Leaves and debris blocking the gutters can cause water to back up under the shingles. Have your gutters cleaned out regularly at least once and preferably twice if your home is close to tall trees. 4) Water leaks: Have your roof, flashings and window caulking looked at to make sure there's no way water ingress can cause problems. Check older toilets and replace wax rings if necessary. 5) Do It Yourself Improvements: Use qualified licensed tradespeople - especially for plumbing and electrical work. Take out permits if they're necessary. Label the breakers on your electrical panel. Any property that has had proper maintenance done before selling fares much better during showings and price negotiations. 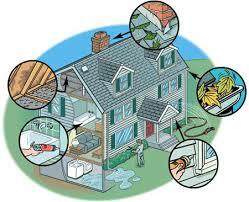 You can consider having a pre-sale inspection done by your own Building Inspector to be even better prepared.